Finally, A Ketogenic Cookbook That Makes It Easy To Live A Ketogenic Lifestyle! In this Cookbook you'll find delicious, 100% ketogenic recipes that will allow you to easily and effortlessly enjoy a low carb diet. If you've read my book 'The Ketogenic Diet' then you already know what ketones are, what role they play in metabolism and why the ketogenic diet is so good for you. However, it's important that you enjoy the food you eat. That's where this book comes in. You'll Be Shocked To Discover How Tasty And Satisfying A Keto Diet Can Be! By utilizing the recipes in this book you'll start to see and feel the benefits quickly. Not only will the ketogenic diet easily burn off those pesky fat reserves you've been struggling with. You'll also speed up your metabolism, have clearer skin, lower your risk of disease and fight seizures and other neurological conditions. The ketogenic diet can help prevent, treat and even reverse a whole host of health conditions. As we eliminate the excess glucose, health problems and excess weight seem to become a thing of the past. You may be wondering what you can cook in order to get these results. Everything from comfort food, healthy light dishes and desserts to satisfy your sweet tooth are included. In the 'Ketogenic Cookbook' you'll find out how to create delicious meals that taste like a treat, but these meals are in fact your ticket to a healthier, fitter and happier you! 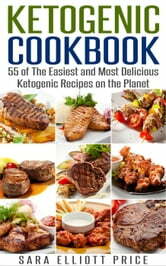 This comprehensive Ketogenic Cookbook combines the best ketogenic recipes into one easy to reference book. You'll find the easy instructions, easy to locate ingredients and this tasty way of eating for weight loss and health refreshing! The Elimination Diet: The First 28 Days! TLC Diet: Manage Cholesterol Counts & Blood Pressure Levels! Bone Broth Magic: Easy and Healthy Recipes for Beginners to Lose Weight, Reduce Inflammation, Fight Infections and Much More! Detox Today: Healthy Weight Loss and Delicious Cleansing Recipes!